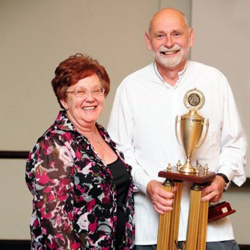 CONGRATULATIONS to Allan who recently won the South African Gymnastics Federation ‘Administrator of the Year’ award. What a brilliant achievement ! Allan was also rewarded for his long service as a National Board Member. He has worked very hard in various positions on the SAGF Committee for countless years and has contributed endlessly to gymnastics not only in KwaZulu Natal, but South Africa as whole. One of his greatest contributions to RSA gymnastics is his Preschool & General Gymnastics programs and enthusiastic, child-centred approach to coaching. He has also been responsible for much of the admin side of things, such as club management software & competition scoring software, competition manager at numerous competitions, Brevet Judge, National Team coach. The list seems endless.